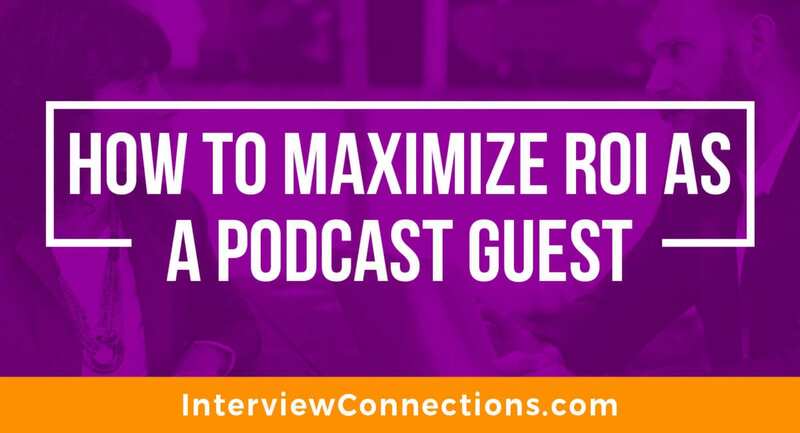 In order to maximize your impact as a podcast guest and achieve the highest return on investment, it’s crucial to put some basic systems in place within your own team for tracking your interviews. This will help you more effectively nurture long term relationships with hosts, promote your appearances and track your results. 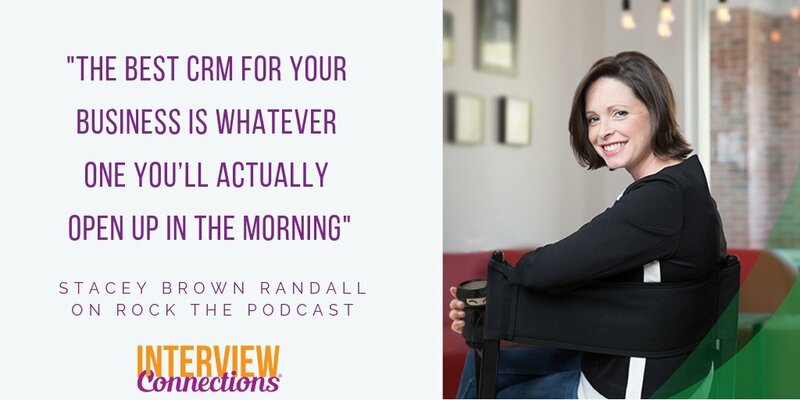 Stacey Brown Randall, an expert in how to generate referrals without asking, is an Interview Connections client who has gotten amazing results through podcast interviews. Stacey uses an assistant to help schedule and organize her podcast interviews. 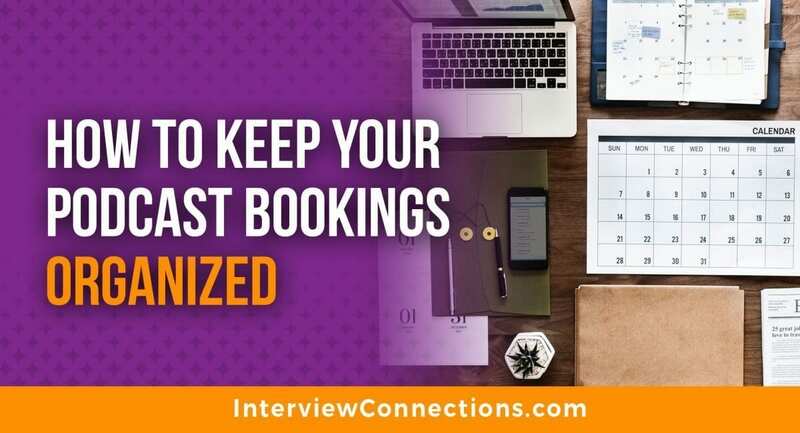 She has a simple and easy to use system in place for booking, scheduling, and promoting her interview appearances that you can implement in your business, whether or not you have a team. How can podcast guests keep all their interview connections with hosts organized? For Stacey, her process is the same whether it’s managed by her or an assistant. She believes in processes and workflows that are super simple. By keeping systems simple, there is less of a possibility for mistakes. She adds that the best CRM for your business is whatever one you’ll actually open up in the morning. Stacey tracks all of her podcast interviews in Microsoft Excel in one master spreadsheet. As soon as she is connected with a podcast host, she schedules the recording right away or forwards the connection email to her assistant to schedule. Since most podcast hosts will ask the same kinds of questions when scheduling a guest, Stacey keeps a spreadsheet with those answers to make it easy for her and her assistant to complete the booking. Once she secures a date and time for her recording, the podcast is added to her spreadsheet. When adding a podcast interview to her master spreadsheet, Stacey will include the podcast name, host name, and date of the scheduled interview. This helps her track when her interviews are occurring for each show (interviews are also being tracked in her calendar). Once the interview is recorded, Stacey will add to her spreadsheet the live link (which most hosts will send), the episode number, and the host’s mailing address. Stacey recommends asking the host for their mailing address so you can send them thank you cards, holiday cards, and anything else that will help nurture this new relationship. Having a great connection with a podcast host during an interview can also lead to organic leads. Hosts will often reach out after hearing her on a podcast, or through the recommendation of a host asking her to be a guest on their show! She tracks these interviews on the same spreadsheet, keeping a separate tab for these organic leads in the same format she uses for the shows we book her on. Stacey was generous enough to share this spreadsheet template with our listeners to make it easy for you to track your interviews! Click here to get your template! Offering a free gift to the podcast audience is a great way to drive traffic to your website and build your email list. 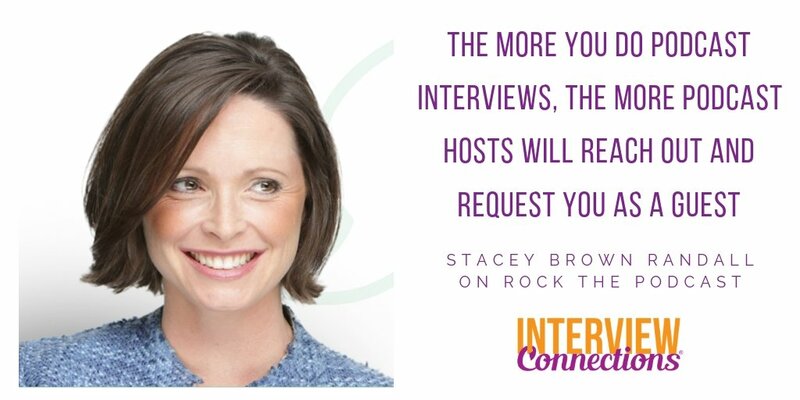 This is something Stacey did a lot when she first started working with Interview Connections to get booked. What motivates you to attend a conference? For some entrepreneurs, conferences are a place to learn from all the speakers in the various breakout sessions and keynote talks. For others, conferences provide an opportunity to network and generate more leads. This year, Margy and I flew to Orlando, Florida where we attended the 5th year of Podfest Multimedia Expo! 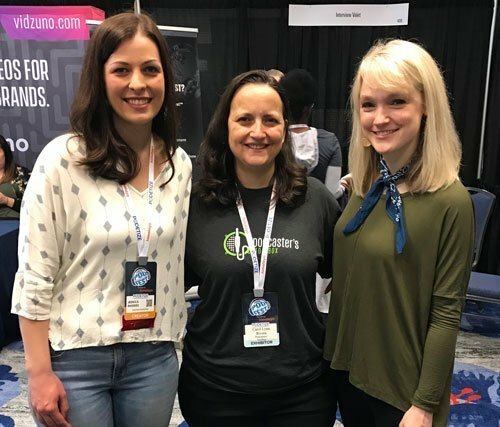 We are big supporters of Podfest because this event in particular has been excellent for networking, lead generation and has helped spark new ideas for how we can grow our podcast. If you’ve never heard of Podfest, go listen to my interview with the founder, Chris Krimitsos on our podcast here! We have been sponsoring Podfest since year one. In fact, Chris said we may have been their first ever sponsor, which we take a lot of pride in because this conference has grown so much and I am glad we have been attending every year! Even though in year’s past we have had a booth on the trade show floor and have led breakout sessions, we made the choice to not apply to speak or exhibit. Instead, we bought a quarter page ad in the program and simply attend this year. Having a booth was a great way to get exposure for Interview Connections, but it also meant we didn’t have as much freedom to network and attend sessions. Margy and I flew in Thursday evening and had a full day at the conference on Friday. We hit the tradeshow floor first to see some friends and clients who had booths, like Ralph and Carol Lynn at Podcasters Toolbox. We’re honored to have the opportunity to consult with them on their business a few times a year through our VIP Strategy Days. Margy and I share more about how we started offering VIP Strategy Days in this episode of our podcast. One of our newest clients, Mikey Moran and his podcast co host, Zakiyrah took us to lunch where we got so many tips and ideas for how to continue growing Interview Connections. Mikey’s company has 25 employees so as we grow our business we find a ton of value in learning from those who are further along in their entrepreneurial journey! After lunch, we went to the lobby coffee bar where we met Brett Burky, founder of PaperSac. Tyler Sheff referred Brett to Interview Connections a few weeks prior so it was great to meet him face to face and talk more about working together! Brett said he wanted to meet more real estate podcasters so I sent a text to our long time client, Kevin Bupp who was able to come meet us as well! 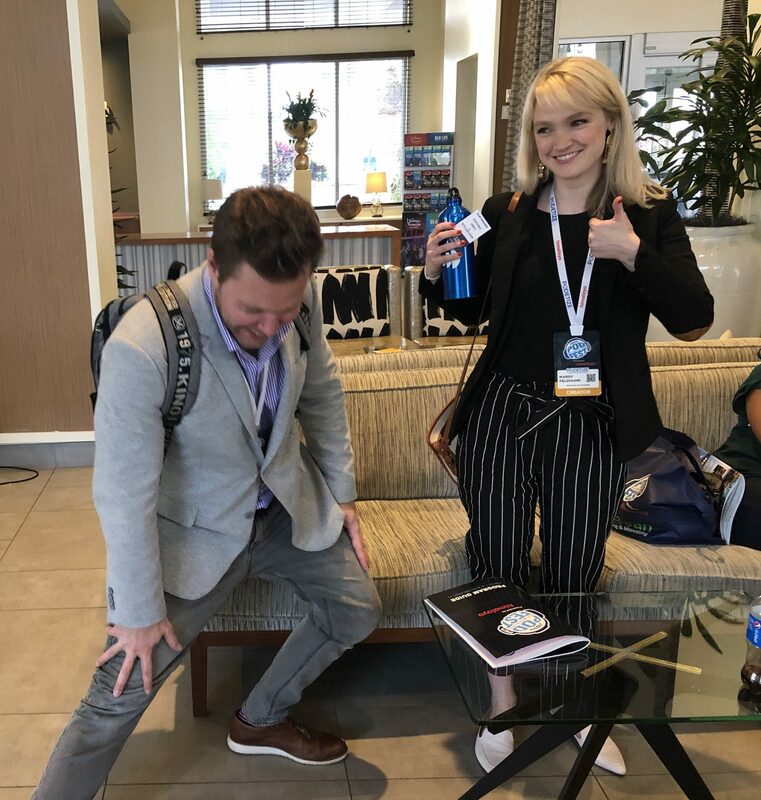 To hear my panel about how to be a great interviewer with Tyler Sheff, Erica Mandy and Ryan Gray from Podfest 2018, click here! Another reason we love meeting clients in person is bonding over smart fashion choices like stretchy jeans and sweatshirt material blazers. After that, we all walked over to the Real Estate panel moderated by Tyler Sheff. Panelists included Kerry Lutz, Dustin Matthews, Kevin Bupp and Sharon Vornholt. While this session was focused on real estate podcasters, they had some amazing stories of how much their podcasts have changed lives! Get a USB Microphone and focus on providing valuable content. Most listeners can’t tell the difference between the ATR 2100 which is $70, and a $500 microphone. Don’t fake it til you make it, just teach what you know. If you’ve done 3 deals, you know more than someone who hasn’t done any deals. We interviewed Kevin Bupp on our show about his podcasting strategy here and if you’re a real estate investor who wants to learn how to leverage podcast interviews, check out this episode of our podcast! After this session, I said hello to Scott Carson of The Note Closers podcast. He gave us a great idea for how to leverage LinkedIn to find and pitch podcast hosts, and also introduced me to Scott Smith who I had spoken to on the phone a few weeks prior. I love how conferences give me the opportunity to meet people in person that I email and talk to on the phone! 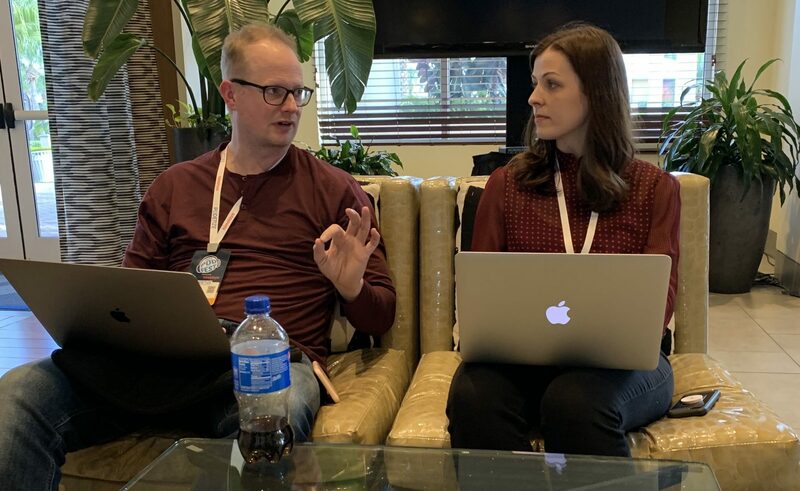 One of the major highlights of our trip was having our client, Mikey Moran go through our website with us and give us a ton of ideas on how to improve our SEO and website conversion. He also helped us set up Facebook ads to retarget our website visitors. Margy and I were so thankful for this amazing support and just love how successful 7 figure entrepreneurs are so willing to help other business owners succeed. We laughed at how we probably would have paid a lot of money to do what he helped us set up in 20 minutes! We wrapped up our Friday with a sales call back in the hotel room and a conference party at Howl at the Moon! We only stayed for one drink but the photo booth made it worth it. Saturday morning involved some travel arrangements as we tracked a winter storm going across the midwest. We originally had a 6:30am flight scheduled for Sunday morning but with my son’s 6th birthday that same day, I did not want to risk have a delayed or even cancelled flight. Also, past Jess and Margy did not account for how daylight savings time would make a 6:30am flight incredibly difficult. 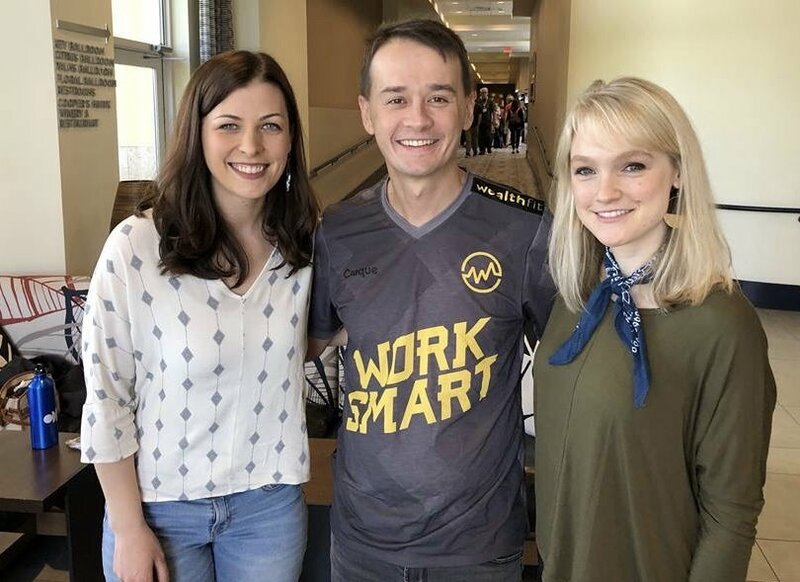 We rescheduled our flight for Saturday evening and wrapped up Podfest by meeting with a few other friends, like Dustin Matthew, host of Wealth Fit, and watching Michael O’Neal’s funny and helpful keynote presentation. Podfest Multimedia Expo is a conference we will continue to support and attend because of the people who run it and the people who attend. The conversations we were able to have by flying down to Florida for this conference were worth it alone and the knowledge we gained by attending the sessions was also a huge value add for us. 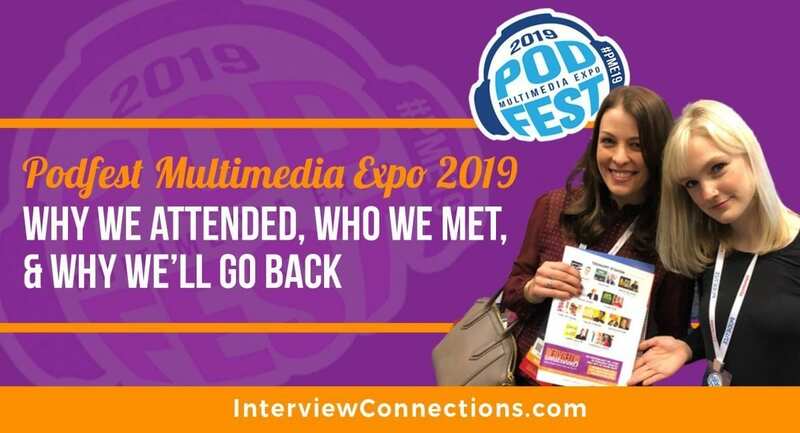 On today’s episode, Jessica interviews the creator of Podfest Multimedia Expo, Chris Krimitsos, about the upcoming event and what attendees can expect. Podfest 2019 will be held in Orlando from March 7-9 and we hope to see you there! At Interview Connections, we know how to harness the power of a podcast appearance. We are a non-traditional PR firm with a singular focus on podcast interviews. With more than five years of experience in the field, we’re the leading booking agency for podcasters and guest experts. Our fearless founder Jessica Rhodes, literally wrote the book on rocking both sides of the mic. Whether you’re newly pod-curious, a veteran podcast guest or an aspiring host, the opportunities for marketing through podcasts are endless. On an episode of the Marketing Speak podcast, Jessica talks with host and SEO expert Stephan Spencer about the strategies you can steal for getting –– and keeping –– clients with every interview. How does it work? It’s complicated –– Google’s algorithms are constantly changing. But the gist is this: podcast episodes have no expiration date, and an episode’s show notes, linked to our own site and social media profiles, can juice your search results for years to come. Plus, as you take the podcast world by storm, your name or business float closer to the top of search results as you grow your reputation as a trusted expert in your field. Ideally, it’s a self-perpetuating cycle: listeners become leads, leads become clients, and clients invest further in you as they watch you succeed. Established hosts can find advantages to guesting, as well. As you get to know other podcasters, doors open and you become a trusted colleague in your field. Interview Connections illustrates this first-hand — its network is its biggest asset. “When I’m going out there and getting interviewed on shows, I’m staying connected with what’s happening in the podcasting industry,” she says. As a guest, you’ll be a hero if you make the host’s job easy. The one-sheet should be long enough to include all your bragging rights, but short enough so the podcast host can easily read that as an introduction to their show. (That’s also why third person, not the first-person “I,” is key). And of course, those questions are ones you’re prepared for. Polish off your one-sheet with your contact information, including your website and social media links. Add your Skype handle too, since you’re likely to use it for the interview itself. Whether you’re pitching yourself or someone is doing it for you, make sure you’re doing it well. Like a typo-laden cover letter addressed to the wrong company, a crappy pitch will go straight to the trash. As a podcast guest, it pays to focus on one goal at a time, Jessica advises. It’s unrealistic to get new clients, increase your podcast audience, and spike your website traffic from one podcast interview alone. If your goal is to grow your own audience, for example, draw potential new listeners toward your podcast with a specific suggestion. Title your shows (beyond episode numbers) and direct the audience to a particular one. “Ask them subscribe so they don’t just look it up and forget about it,” Jessica says. What about lead magnets –– the freebies so many podcast guests offer so listeners opt in to a mailing list? Instead, Interview Connections concentrates on tangible results: metrics like revenue, profit, building a successful team, client retention, and employee retention. For Jessica, podcast ROI is truly measured by a healthy bottom line. Those kinds of numbers reflect a reputation with a firm foundation. “It gives me more credibility than just talking about being #1 in iTunes, which I’m not,” she says, noting that followers and rankings don’t necessarily mean real-world success. This article is based an episode of Marketing Speak, which is hosted by Stephan Spencer, author of “Google Power Search” and other books. Jess discusses how she first got started booking people on podcasts and how at the time, she was the only one sending out pitches. Margy and Jess also talk about what sets Interview Connections apart from all the other podcast booking agencies that are in existence today. To work with and learn more about us, visit InterviewConnections.com. Jessica talks with Interview Connections client Arlene Cogen about working philanthropy into financial and estate planning and how to decide how much to give back. Click here to check out Arlene’s book, Give to Live. Many of our clients at Interview Connections have become seasoned interviewees. If you feel like you’ve been on every podcast in your niche, but don’t want to stop getting booked, you should know there are huge benefits to being a repeat guest on a show you’ve already appeared on. The ice has been broken! If you were a friendly and engaging guest (and we know you were!) the host already knows, likes and trusts you so your second interview will be even better. Also, in second interviews, hosts will reference back to the first interview, motivating listeners to go back and listen to your original appearance! Returning for a part 2 will remind old listeners of who you are, and introduce you to new listeners! It takes 7 “touches” for prospects to take action. Listeners who heard your first interview will be more likely to take action and connect with you after hearing you for the second time. Don’t go on a show for a second time to answer the same questions. That would be silly and repetitive. When we pitch you to a “repeat” host, we’ll showcase what NEW content you can share with their audience. Sharing a new book, project, or topics you didn’t get to in part 1 will ensure the content is fresh is valuable for old and new listeners. You can learn more about podcast interviews by listening to Rock the Podcast, available on Apple Podcasts or Stitcher Radio! Live from FinCon Orlando 2018, Jess and Margy talk with John Lanza about teaching kids money sense. Congratulations on your raise, Nathan Rhodes. If you want to teach your kids about money, check out Money Mammals. On today’s episode, Jess and Margy explain why coaches and consultants are great candidates for being interviewed on podcasts. This is a high end networking strategy! Each host who interviews you is a potential client. Before anyone hires a coach or a consultant, they need to trust that person and podcast interviews are a great way to build trust with people. Exposure for your business – The more you get interviewed on podcasts, the more well known you’ll be to your target market. For example, if you’re a coach for women entrepreneurs leaving corporate, we’ll book you on podcasts that that kind of female is listening to. When they see you popping up on a bunch of shows they like, they’re more likely to want to work with you. Search Engine Optimization – When you are interviewed on podcasts, you will get a link back to your website in the show notes. The more backlinks you have to your website, the higher up your site will be in Google search results. 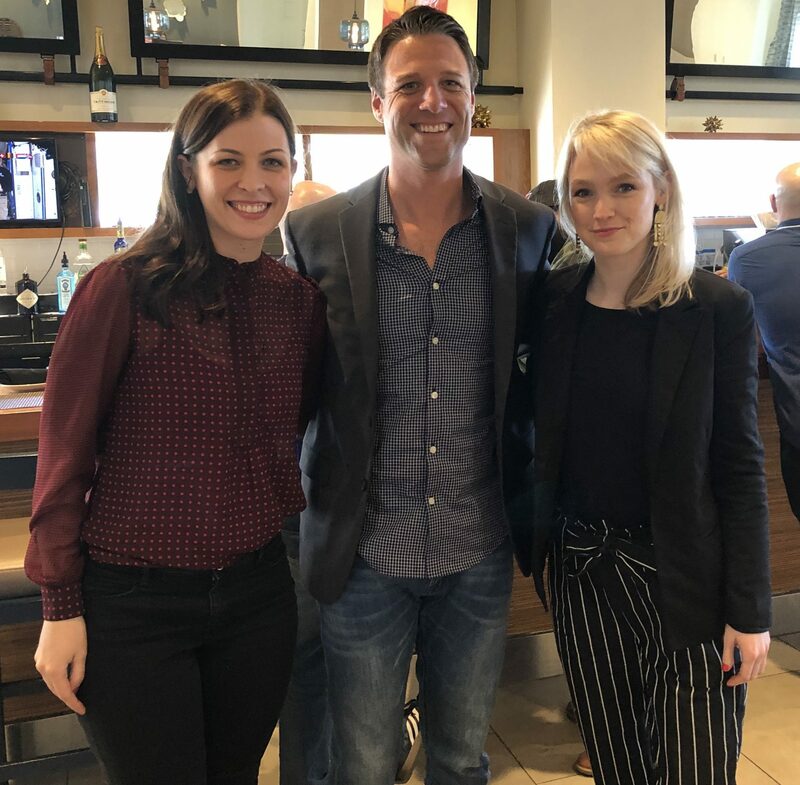 Focus on the host – When we work with coaches and consultants at Interview Connections, we get super clear on who their ideal coaching client is, and we find shows that are hosted by that kind of person. Build a great relationship with the host and they’re the most likely person to want to hire you as a coach. Create a community and invite listeners to join. In my experience and opinion, people hire coaches/consultants for the communities they have created. 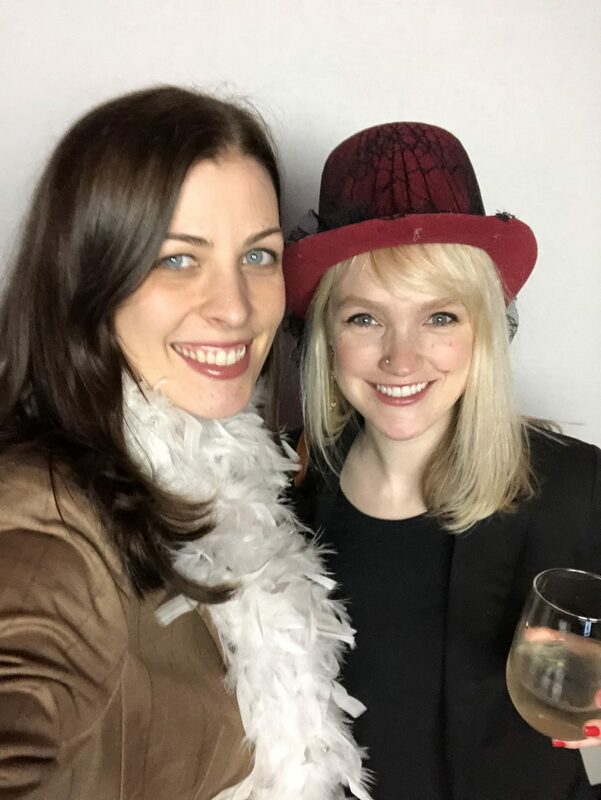 We became a coaching client of Ali Brown because she’s created a community of 7 figure women entrepreneurs and that is who we want to network with and learn from. Our client Heather Dominick has created the Highly Sensitive Entrepreneurs community and people become a coaching client of hers because they want to be around other HSEs. Heather has been a client for over a year and every month she sees people join her community who heard her on a podcast. GIVE IT TIME – Be patient and manage your expectations. You need to stick with this strategy for at least 6 months to know if it’s working for you. Click here to listen to Jessica’s episode of Marketing Speak.